Welcome to the first installment of Worker's Comp, chronicling the paper cuts and perforated esophaguses of your fellow working man. 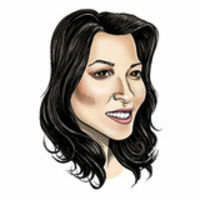 Suggest interesting injuries by emailing maureen@gawker.com. Helmut Kirchmeier was a German tax inspector when he went to a circus and saw a sword-swallowing act. 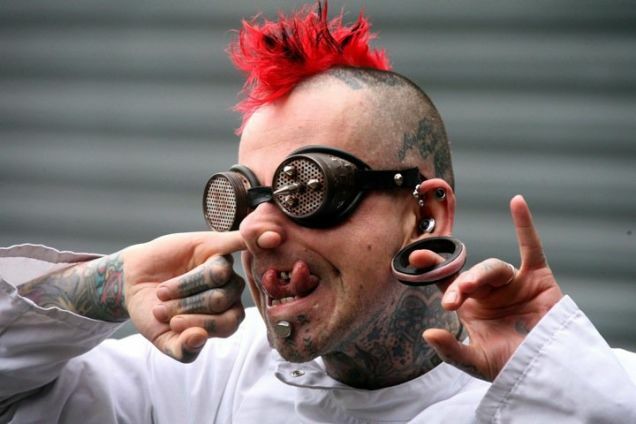 Twelve years, 200 tattoos, and the total elimination of his gag reflex later, he is Hannibal Hellmurto, professional sword swallower and hypnotist. 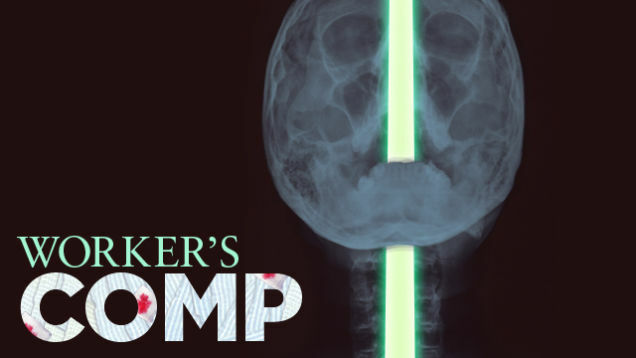 While swallowing a neon lightbulb before a live audience last year, he tore a 4-inch hole in his esophagus—then recovered and returned to the stage. Last night, after a successful performance with his Circus of Horrors troop, he told us about his injury and recovery. First off, do you call yourself a "sword swallower"? It seems like you swallow a lot of other stuff, too. Yes, but I do swallow a lot of stuff. I swallow hedge clippers, I swallow a blade that's attached to a revolving drill, the handles of umbrellas. And it was a neon lightbulb that punctured your esophagus? Yes, but it didn't quite "puncture." It's more like, well, say you're an athlete. A runner. And a muscle tears. That's what happened, my esophagus tore. It wasn't exactly a puncture, it was a rupture. How big was the rupture? I read that it happened while you were performing on stage. What was that like? You know that something went wrong because you can feel it. A burning sensation. A burning pain. Straight when it happens, it doesn't feel too bad. It gets worse as time goes on. After half an hour you get difficult breathing. After forty minutes it's really bad. After an hour, you can't bear it. Between the time it happened and the time I went to the hospital, about an hour passed. They took an X-ray and knew exactly what was going on. It's not your everyday injury that you see in the hospital. But on the other hand, they took really good care of me, because for them it's interesting to see something that unusual, as well. When the esophagus tears you get a lot of blood, and it started filling up my lungs. So you start literally drowning alive. They had to drain all the blood from my lungs, but it's quite difficult to stitch up an esophagus, so you have to let it heal by itself. They kept me in [the hospital] and fed me nutrition through tubes that went into my stomach. All my liquid came from an IV drip. So I didn't eat or drink for five weeks. It's very boring. Your mouth dries out. You get bored because normally you have breakfast, then you do something, then you have lunch. But I just sat there the whole time, for five weeks. Not for a while. Because my lungs were damaged, they had to give me oxygen through a tube. So I had a cut in my throat and tube going in there, and during that time I couldn't speak. That was for two weeks. So two weeks of not speaking, and five weeks of not eating or drinking. It wasn't the best of experiences. When did the doctors give you the go-ahead to start swallowing swords again? Well you will never, ever in the world find a doctor who says it's fine to sword-swallow. That will never happen. So you have to go by your feeling. I knew the esophagus was healed when I was released from the hospital. I waited twelve weeks, and then I started training again. The first performance I had was just before Christmas. I was nervous as hell. But obviously I had trained before. You don't just go on stage and try it. I had been training at home. What was your first at-home attempt like? It was scary, but it was something very small and blunt. 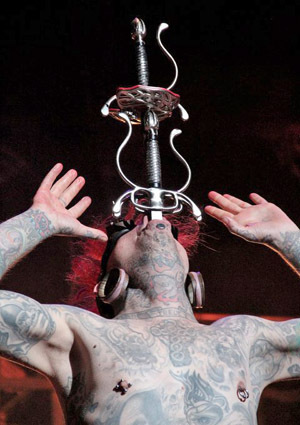 Has your career as a sword swallower changed? Not really. I can do exactly the same things. Just like before. The only difference is that I stopped smoking while in hospital. What's harder, quitting smoking or swallowing hedge clippers? Um, hedge clippers is much harder. I read that many sword swallowers won't swallow neon lights, because they say it's too dangerous. [Due to glass shards and mercury, among other things.] What do you think of that? To be honest, I can't understand. It is a very dangerous thing to do, but you always have safety measures. There is always a cover so it doesn't break. But to be honest, whoever decides they want to do this or not do that, it's fine. I saw on Facebook that you're married to fellow circus performer Anastasia IV. Yes, she does air hanging. Does sword swallowing affect your love life? Because that's the joke, right? [Mumbles with shame.] Gag reflex. Yep. No, not at all. Yes, two things please. One is that I'm part of the Circus of Horrors, so if you can mention that, it'd be great. Sure, I'll link to the webpage. And you're based in the States, right? We might be coming to the States in autumn, so if you can mention that, it'd be very highly appreciated. Oh, fantastic. I will do that. Have you been injured in the workplace? Got ideas for future Worker's Comp columns? Email maureen@gawker.com.